Saint Evdemoz led the Georgian Orthodox Church in the mid-17th century during the reign of King Rostom-Khan (1632–1658), a Georgian who had converted to Islam. Having murdered King Luarsab II of Kartli and chased out King Teimuraz I of Kakheti, the Persian shah Abbas I had declared Rostom-Khan ruler of a unified Kartli-Kakheti kingdom. Rostom tried to be accommodating in his policies and protect the beliefs and traditions of both the Persian shah and the Georgian people: he set a standard salary for the Georgian clergy and even built churches, but society deteriorated rapidly nevertheless. Human vices became commonplace, and sins like those of Sodom and Gomorrah were multiplied. The nation was so overtaken by sin that even the clergy ceased to conduct themselves in a manner befitting their God-given role. But the chief shepherd of the Georgian nation would not yield to the moral decline of his flock, and he confronted this crisis with conviction and fearlessness. Several times he led his most valiant military leaders in revolt against Persia. Following the example of Catholicos Evdemoz, several Georgian princes rebelled against the pro-Persian policies of Rostom-Khan and cast out the Islamic influence from their territories. Evdemoz was the spiritual father of Rostom-Khan’s wife, the faithful Queen Mariam, the daughter of Manuchar Dadiani, Prince of Samegrelo. As a result of the holy labors of Catholicos Evdemoz and Queen Mariam, the Christian soul of the Georgian people was not entirely extinguished. The Georgians built churches, wrote spiritual literature, and gradually regained their national consciousness. Catholicos Evdemoz preached throughout the country and developed and implemented a plan to bring King Teimuraz, who had been driven out by Shah Abbas, back to the throne. Naturally Rostom-Khan felt threatened by the strong influence Catholicos Evdemoz had on the people. In 1642 he arrested the chief shepherd of the Georgian people and tried to win him over, but neither his feigned tenderness nor his threats could break the firm will of the man who loved Christ and his motherland above all else. 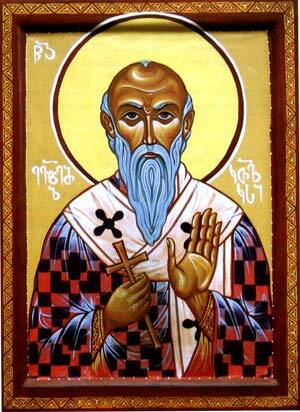 After his arrest, St. Evdemoz criticized the king even more harshly and called on the people to rise up against him. Finally Rostom-Khan ordered that Catholicos Evdemoz be strangled to death in his prison cell, and as a further insult, his body was cast off Nariqala Fortress (in Tbilisi) in the direction of the Turkish baths. That night, a group of Christians stole the body of the holy hieromartyr Catholicos-Patriarch Evdemoz and buried it in the northwest corner of Anchiskhati Church in Tbilisi.